Vatche Boulghourjian's debut feature Tramontane made its world premiere in Critics' Week at Cannes on Tuesday. The film, about a blind man on the trail of his origins in post-war Lebanon, took four years to make. The following is a chronological account on the making of Tramontane, told from writer/director Vatche Boulghourjian's and producer Caroline Oliveira's points of view. Vatche: I had been writing feature screenplays incessantly since my NYU thesis short film "Fifth Column" had been selected by the Cinéfondation at Cannes in 2010. In January 2012, I finished the first draft of the screenplay that would become Tramontane. I wanted to make this film and wrote it such that actually making it was within my means. In Lebanon, where the film is set, I started to plan the shoot alone, with a miniscule budget, minimal crew, and a handful of actors - just as I had made my short films. Little did I know the adventure that lay ahead with this project. Caroline: Vatche and I were classmates at the Graduate Film Program at NYU and I always wanted to work with him, so when he told me he had a script I was really excited to read it. Tramontane was impossible not to fall in love with: poetic, heartfelt, intelligent and sincere. Vatche's vision for the film was clear from the start, but he was also open to feedback, and we had great, long conversations about character, story, tone, and theme. In the end it was all very organic - a true collaboration. The first step was to find institutions that could support projects like Tramontane: an international feature with no attached cast and no prominent EP. Caroline: The early support we received from different regions around the world was extraordinary. Through Biennale College Cinema, we received our first exposure to creative feedback and confidence. From Doha Film Institute, we received our first grant to develop the script further. Vatche: In these early stages, we also brought together our key creative collaborators, including composer and sound artist Cynthia Zaven, and our longtime friend and ace cinematographer, James Lee Phelan. I also immediately began casting in Lebanon with the intention to form an ensemble of professional and non-professional actors. Most importantly, for the lead role, I wanted to find a blind actor - not a sighted actor attempting to capture the complexities and subtleties of daily existence with blindness. Following months of research we met Barakat. Blind since birth and a musical prodigy, Barakat truly embodied the lead role, and was eager to perform. Caroline: Sundance Institute became a crucial part of our development process. First was the Sundance Creative Producing Lab, which I was honored to attend in July 2013. This was a pretty incredible experience. It's a true privilege to discuss your project with the Creative Advisors, all accomplished independent producers, including Mary Jane Skalski, Paul Mezey, Anthony Bregman, and Jay Van Hoy; and to also connect with the other producing fellows. Everyone in the room was deeply committed to making each project better and also become a reality. I definitely became a better, more prepared and confident producer after the Lab. Vatche: That November, I was invited to be part of the Rawi Screenwriters Lab, a collaboration between the Royal Jordan Film Commission and Sundance Institute. Set in the middle of a magnificent desert, close to the ruins of Shobak castle, Rawi all but encapsulated the romantic ideal of a site for a writer to be submerged into reflection, mining the interior for answers, in silence and in awe of the tremendous landscape. This was my first opportunity to focus exclusively on the screenplay, with the incredible fortune to be surrounded by advisors who pour their energies into discussing the soul of the project. By soul, I mean that intangible heart of a written piece, the universe where the characters of the story exist in flesh and blood. The Lab, I soon learned, was not about the technical refinement of the craft. This was liberating and transformative. My conversations with advisors Mo Ogrodnik and Jeremy Pikser lasted hours in and out of our allotted times. We rarely spoke about craft, strategy, structure; we spoke about the characters as if they were friends or relatives and we were quietly talking out of concern for their wellbeing. By believing in characters as real human beings, and loving them, structure fell into place organically because I followed the real motives and logic of the characters. At Rawi, I also met Paul Federbush, the International Director of the Feature Film Program at Sundance Institute, who would from this point onward shepherd the project and guide us at every turn. The lab was an extraordinary experience. Caroline: The next important step was putting together a producing team. I am not from Lebanon, so it was important to find a Lebanese producer who would support Vatche and guide us through the local filmmaking scene. Vatche: At the Dubai Film Market, I met Georges Schoucair, the CEO of the distinguished Lebanese production house, Abbout Productions. Soon thereafter, Caroline, me, and the Abbout team were planning the production in earnest. This was a turning point for Tramontane; Caroline and I had found partners who believed in the project as much as we did. In the year that followed, we applied to every institutional or governmental support establishment. We traveled to forums and workshops around the world, including the Crossroads co-production forum at the Thessaloniki International Film Festival where Tramontane was awarded the Arte International Prize for development. The same year, we had the great fortune to also team with Gabrielle Dumon of Le Bureau, the highly respected Paris-based production house, who joined the project as a co-producer. Together, we applied for and were awarded the Aide aux Cinémas du Monde production grant of the CNC. With a passion for the story and a common view on how to bring it to life, the production team of Tramontane formed organically and set forth together to make the film. We scheduled principal photography for spring 2015. In January 2015, the Sundance Institute invited me to the Screenwriters Lab in Utah. Although we were at significantly advanced stages of preproduction, the Screenwriters Lab was a watershed moment that impacted the film at the 11th hour. Leaving the adrenaline-infused environment of Beirut and re-immersing myself into the soul of the story at this stage of development, proved critical to affording me some remove from the bustle and logic of preproduction, and a return to the essence. So, my fellowship at the Screenwriters Lab at this point, was not only important for making final adjustments to the script; it was vital to directing the film. Meeting Zach Sklar, my first advisor, was like reuniting with a friend I hadn't seen in years, such was his affability and familiarity with my writing. We spoke for hours but hardly felt any time pass; we were catching up on lost time and didn't want to waste a second. I absorbed every syllable he uttered, for this was guidance coming from a master screenwriter with a massive wealth of experience and wisdom. Soon I discovered that such passion and commitment was true of all my advisors at the Screenwriters Lab. Next I met Susan Shilliday, who had all but dissected the screenplay word by word, exposing the structural blueprint, and led me with care along the narrative pathways, alerting me to dangers and suggesting ways to circumvent them. This kind of deep examination continued with Michael Goldenberg. Indeed, I felt like an athlete being coached and inspected moments before a race; there was excitement and anticipation - and satisfaction - with each encounter. Michael and I checked the sturdiness of the foundations, the narrative threads, to allow the structure and themes to breathe. With Peter Straughn, we moved to a wider discussion of themes running through the screenplay, making sure the concepts, which spurred the screenplay in the first place, were still intact. Each advisor had a unique approach and purpose; each meeting was meant to build on the other, layer by layer. By the time I was across a table from Tyger Williams, we were talking about yet wider issues, tracing the longue durée, the historical forces that had molded the world within the screenplay. We were talking about the history of a country and its effects on the memory of its inhabitants, how history impacts private lives and how memory informs action in the present. Discussing these issues with such candor revitalized the feeling of absolute need to make this film. Finally, my meeting with Naomi Foner was a cross-examination, one last scan to confirm that the bolts are fastened tight and secure, ready to re-embark into the world and production. So there was a pattern to the overall design of my successive meetings: from the minutiae of words, choices and placement, to the vast concepts, stratum by stratum, assessing the durability of the script. 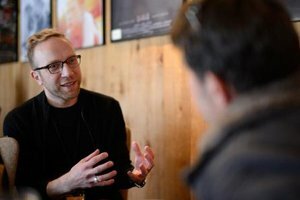 I must also stress that in between all of my meetings with advisors, I was continuously discussing my project with Paul Federbush and the Sundance team, who devoted themselves to making sure that the ameliorations to the screenplay made sense and how these would be reflected in directing the film. The methodical rigor that I encountered at the Screenwriters Lab afforded me the clarity and focus before plunging into production. Something I can say without any reserve is that, even at the latest stages of development, my openness to learn at the Screenwriters Lab unquestionably and significantly impacted the final film. There is always room for change, even right before production. One has only to be honest with oneself and be open to accepting new ideas whenever there is room for improvement. There is always room for improvement. I returned to Beirut in a fever, ready to tear through the shoot. We began principal photography in mid-March, for 29 solid days. There is nothing more gratifying than seeing what has only been imagined; each day of the shoot, brought with it that deep satisfaction, for me and everyone else on the crew, of seeing each page of the screenplay translated into life. Caroline: The Institute's support carried on through production and post. We would reach out to Anne Lai and Paul Federbush (and still do to this day) whenever we had a question, a big decision to make or just to relay good news. They also kept checking in, making sure we were on track. Anne and Paul never gave up on Tramontane and that was a huge incentive for us. Paul introduced us to Alex Akoka from Film Factory, who later became one of our Executive Producers and who provided our team with the best post production we could have asked for. Vatche: That June, I began the long and rewarding road of editing the film with Nadia Ben Rashid whose breadth of work included Timbuktu. She brought her experience to the editing room, and slowly the film began to emerge. Again and again, the rhythm and tone of the screenplay that I was able to establish at the Screenwriters Lab invariably affected the edit. [Through rough cut viewings, the expert and sincere eyes and ears of my producers, as well as of the Sundance team, allowed for that distance in my case. One thing that I learned in this process was how closely it resembled the writing phase and wading through feedback. The difficulty lies not in stubbornly resisting change or the unequivocal acceptance of every suggestion; the real difficulty is to filter everything that is said through the inner prism where the idea originated and dictated the sensibility of the project. This process continued well into the final stages of finishing. The sound design was carefully crafted by Rana Eid from Db studios and expertly mixed by Julien Perez at the Film Factory studios in Paris, enabling the overall concept of the movie to be understood by the blind through sound and music alone. Caroline: It is definitely a marathon. It tests your commitment, your patience, your resilience. But, unlike a marathon, you don't make to the finish line by yourself. You have a whole group of talented people, right by your side, who also made the film happen. The people who believed in your project and worked really hard, making it even better that you could imagine. Vatche: Soon, the film will enter a new phase, it will be shown to the public for the first time at Critic's Week in Cannes, and presumably start a life of its own. I feel extremely privileged to have collaborated with the extraordinary minds who devoted their hard work, wisdom, resources, and insights to the project. Above all I am grateful for the veritable family that formed around Tramontane, the people who embraced the project with all sincerity and faith - and brought joy to the process of making a film. As much as we learned and continue to learn in the course of making Tramontane, this was nothing less than a spiritual journey, one of self-discovery and awareness, one where the Sundance Institute has always been present to guide us at every stage.